The Amoena Contact 1S Breast Form adheres securely to your body which gives you a new sense of fr.. The Amoena Contact 2A Breast Form adheres securely to the body, giving you a new sense of freedom.. 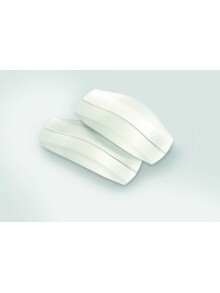 The Amoena Contact 2S Comfort Breast Form adheres securely to the body, giving you a new sense of.. The Amoena Contact 3E Breast Form adheres securely to the body, giving you a new sense of freedom.. The Amoena Contact 3S Breast Form adheres securely to the body to give you a new sense of freedom.. The Amoena Energy Cosmetic 3S Breast Form offers a unique pearl surface on the back of the prosth.. The Amoena Natura 3S Breast Form is designed to drape like a natural breast to move with the body.. The Amoena Natura 2S Breast Form is designed to drape like a natural breast so that it moves with.. The Amoena Natura 3E Breast Form is designed to drape like a natural breast to move with the body.. The Amoena Natura 3S Light Breast Form is designed to drape like a natural breast so that it move..
Pressure reducing shoulder pads, ideal if you find your bra straps sometime dig in. Impossible ..
Mia is another addition to the Soft Cup Mastectomy Bra range by Something Pretty. The Mia Bra is .. The Karla Bra is an enchanting non-wired styling in a soft lace with contrasting embroidery on th.. The Diana Bra, our most popular bra, gives excellent support and uplift. Perfect for post-surgery..